As I’ve said several times before, summer is my absolute favorite season. 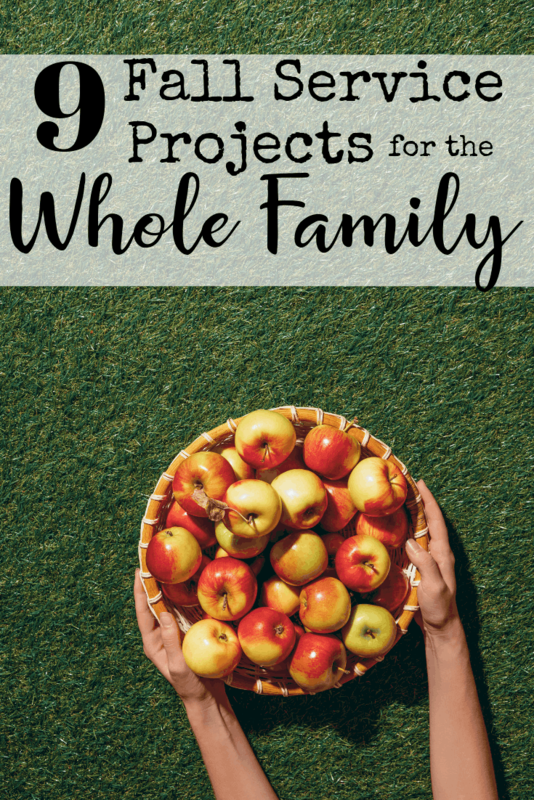 This post, Nine Fall Service Projects for the Whole Family, contains affiliate links for your convenience. 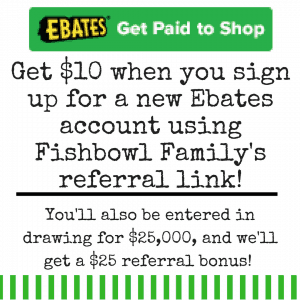 This means that if you make a purchase using our link, we will receive compensation at no cost to you. Read our full disclosure policy. And I know. Some of you are passionate about fall. It’s your favorite and that’s awesome. I’m so glad you love pumpkin spice and sweater weather and football season. I love that you love Halloween. We can still be friends and have different season preferences. I am even willing to concede that there are some pretty great things about fall. Fall is a time of fun for our family. We are able to play outside more because it’s not 105 degrees. We aren’t caught up in holiday hustle and bustle yet. We get over the chaos of school starting, and we find a good groove in fall. And part of finding our stride and getting on a schedule is that we look for ways to serve others. The best way that I’ve found to be deliberate in my parenting is to consider what kind of adults I want to raise. It’s easy to look at their chubby toddler faces and dream of the day when they just stay in their own bed for the entire night. But to do only that would be a disservice to your kids. They deserve to have someone thinking of the long-term for them. I want my kids to be the kind of people who serve others. If you raise kids who have a servant’s heart, you don’t really have to worry about things like feelings of entitlement or selfishness. Those things will be taken care of because your kids are constantly looking for ways to give selflessly to others. This is easier said than done because teaching kids to do for others means that you are doing most of the doing. Your kids can’t bake cookies and deliver them alone. You are the one who has to buy the ingredients and patiently bake with your kids. That right there shuts me down sometimes. 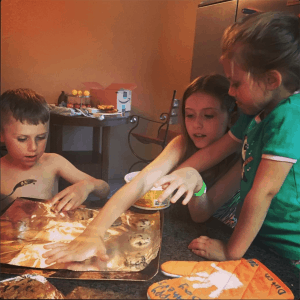 Doing anything productive in the kitchen with four kids is nearly impossible most days. So I quit trying to make it perfect, and we make cookies from premade, store-bought cookie dough. They get to choose where to place them on the cookie sheet, and I let the oldest put them in the oven. After the harrowing hour in the kitchen, you are the one who has to package the cookies. Don’t look for pins about how to make cookies look cute! Go on and give up on being extra. Throw them on a paper plate inside of a ziplock baggie. Because you are the one who has to load everyone up and deliver the cookies. And there will be times that it feels like it is absolutely not worth it. You are teaching your kids to work and do things for others. I guarantee you that most kids would rather eat the freshly baked cookies themselves than give them away. But you are showing them that doing good for others is worth the sacrifice. 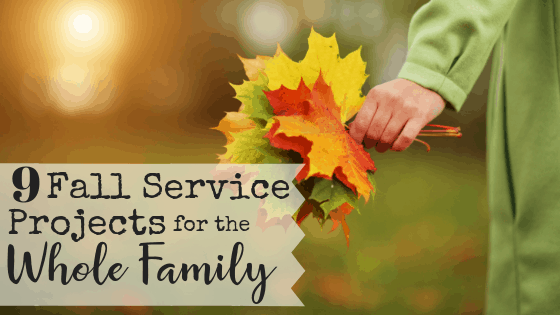 Here are nine fall service projects for the whole family. If you want more great ideas, check out our post 39 Ways to Serve with Your Kids. 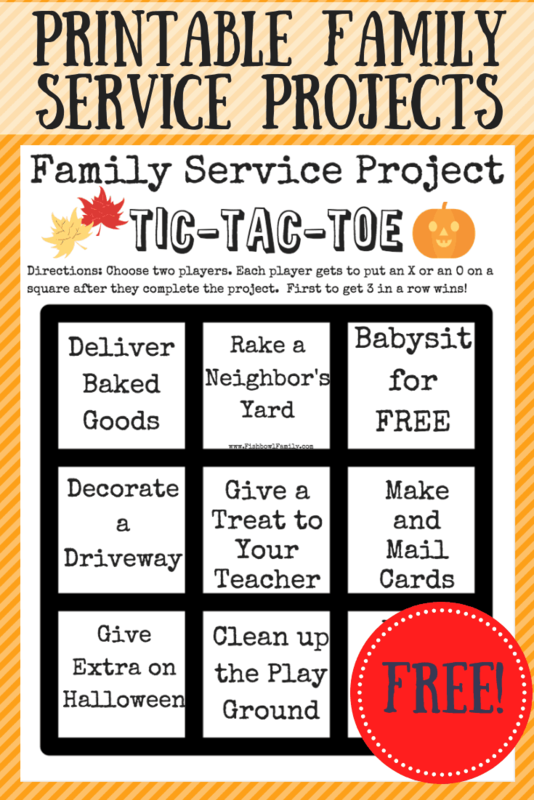 Make sure to subscribe to our mailing list at the bottom of this post, and we’ll send you a free tic-tac-toe board to check off the service projects as you complete them. As referenced above, delivering homemade goodies is always a hit. Try to not go overboard. The point of this isn’t to show people how great your homemade cookies and cream brownie cheesecake bars are. The point is to let your kids help make something delicious to just give away. You can choose almost anyone to bring these to and it will work beautifully. We pray each day that God will give us opportunities to serve him, and we’ve never had a shortage of people in our lives that needed homemade chocolate chip cookies. I do still consider cookies made from store-bought cookie dough homemade because I made them at home. If you don’t have someone in mind, try giving cookies to the nurses at a nursing home, a neighbor you don’t know well, some of the shut-ins at your church, or your trash men. People open doors for fresh baked cookies, and fresh baked cookies open doors for the Gospel. One of my least favorite things about fall is all the dead leaves littering the yard. Growing up, my dad constantly brought home creatures he found outside like tarantulas and snakes, so I’m still a bit scared that I’m going to step on a leaf pile and be taken down by a boa constrictor. I know that’s illogical, but there’s no undoing that in my brain. Personal nightmares aside, raking up the leaves is sort of necessary. I don’t know a ton about yard work, but I think the leaves will kill the grass and possibly become a home for cobras. So while you’re outside raking all the beautiful detritus of fall, look around and see if you have a neighbor with potential viper burrows unraked leaves. After you’re done with your yard, take your kids and go rake the neighbor’s yard. OR get the neighbor’s yard done before you finish your yard. And if your kids are anything like mine, there will be a lot of complaining. But work is part of life, or at least it should be. My concern isn’t raising kids who can turn anything into a game so they can enjoy the raking of leaves. My priority is raising kids who are able to do hard work because it’s necessary. Push through the complaining and have hot cocoa and homemade popcorn when the job is done. For most of us, the last thing we want to do on a Friday night is to add extra children to our chaos. We want to come home, put on PJs, eat pizza, and watch movies on Netflix. Or maybe y’all are young enough you still want to go out and do things on Fridays? Whatever the case, babysitting for someone else is a truly awesome way to serve. You can have your kids help watch the other kids, and it gives a great opportunity to be sacrificial. For example, my kids love pepperoni pizza, but the kids we were watching recently liked hamburger pizza. So we ordered hamburger pizza. From the drama that ensued, you would assume this was the ultimate sacrifice. If you have kids, you know how important it is to go on date nights and make time for your spouse. Most of us just grab a babysitter and go. But I’m sure there are people in your life whose finances simply don’t allow for that right now. Help them out and babysit their kids. You might be saving their marriage. This is one of my kid’s favorite ways to serve. Basically, you take sidewalk chalk to someone’s house and decorate their driveway with encouraging words. It’s super simple if you can get the timing down because you don’t want to do it while they’re home or right before it rains. This is a great activity if you know that someone has had a rough week or has something big coming up. Simply writing simple things like, “You’re awesome!” and “You’re going to ace that spelling test!” can make a huge impact on people. Remember, you are still serving others by doing small things. Everything doesn’t have to be a grand gesture. If you’re like me, you’re always running late. I’ve come to terms with it and basically accepted it for this season of my life. So if you missed the first day of school gift for the teacher, October is a great month for a little treat. When I was teaching public school, some of my favorite things to receive were Expo markers, fine tip Sharpies, and any other nerdy desk accessories like post-it notes and mechanical pencils. I also loved getting candy I could eat stealthily throughout the day like caramel M&Ms or Milk Duds. 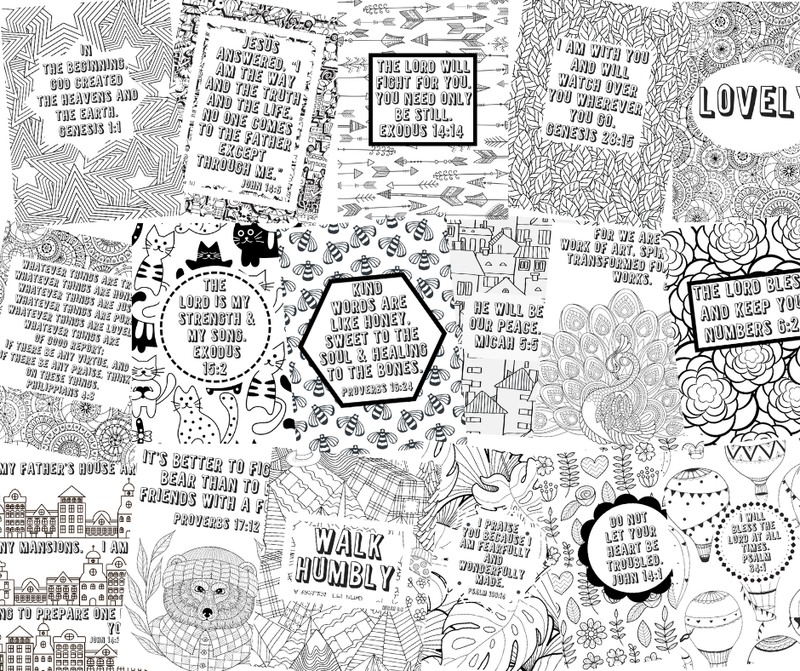 This is a fantastic service project for kids because they love creating stuff anyways. Sit down with your kids and talk about some people in your life who might need some cheering up. This can be friends from school, people from church, relatives, soldiers overseas, or whoever. Let each kid pick a person to make a card for. You should go ahead and decide if you want to fight the fight for them to each do a different person. In my house, whatever the oldest does, the others all want to copy. Then, give them whatever random craft supplies you have around the house and let them go to town. We try to mail our cards because people love getting good mail, and that ensures the craft time is over. Otherwise, my kids will just keep decorating the cards until they weigh nine pounds. Just make sure you’re prepared for the crafting fall out. When my kids are finished, my dining room table always looks like a pinata filled with cut up paper and glitter exploded. If you’re not already helping with a Fall Festival, commit to passing out extra this Halloween. This can be done in two ways depending on your trick or treating plans. If you’re staying home, give some King size candy bars with a cute message like, “Everybody loves a king-sized candy bar, but my king is sweeter by far.” Add your church’s service times at the bottom. When else do you have people coming to your door who are willing to take whatever you hand them? If you’re going trick or treating, have a card to give to people who open their doors to you. It can be something simple like a cute phrase and an invite to church, or you can be more elaborate and host a neighborhood cookout and pass out hotdogs and gospel tracts or invitations to church. When else will your neighbors open their door to you so readily? This one takes a bit of planning but lends itself to a fun activity afterward. You can gather gloves and trash bags and head to the park. City parks are great, but they’re usually very clean. So we often head to a church especially a church with a playground or rec space and pick up trash all over the church campus. Before the kids are allowed to play, have them go around and gather up all the trash they find. We typically use the small plastic bags from stores because they’re easier than the large kitchen trash bags for kids to carry. After all the trash is picked up and thrown into the trash can, we let the kids play. It’s really great to see the pride they take in their local park or church after they worked so hard to clean it up. This project has two great side effects. First, they are passionate about not littering now. Whereas before, they’d drop a candy wrapper without a second thought, now there’s much ado. Phrases like, “HEY! Don’t you know someone has to pick that UP?!! ?” are shouted when their baby brother drops a wrapper. Second, they start to see that Christ’s church isn’t just the group that we meet with every Sunday. They love to think about Christians that they’ve never met showing up to church and being surprised at how clean the property is. They wonder if they will look for the responsible party. Will they think it a Halloween miracle? This is by far for the most involved project but is also probably the most rewarding. Find an elderly adult, and plan a time to go to their house and help them. The Bible is pretty clear that we are supposed to take care of the widows, but we often don’t. The senior adults at my church are so awesome. They have this amazing wealth of knowledge and they’ve lived so much life. I often feel stupid even thinking I have something to offer them. So many of them are very lonely. Changing some lightbulbs while I’m there and letting my older children move around some heavy stuff, is just icing on the cake. So take some time and pray about it. Ask God to reveal someone to you that needs your help. Don’t overthink and worry and stress. The great thing about doing this project is that it’s an opportunity to build a relationship. After a first visit, you can send cards, bring desserts, color on the driveway, and all kinds of things for your new friends. It is good for kids to love and serve others. Service projects make our world a little bigger. We have a tendency to get very involved in our own lives and slowly our world shrinks. Serving others makes our world grow. It opens our eyes to the lives and needs of those around us. It puts us in other people’s space with fresh eyes to see their needs. What are some fall service projects your family likes to do? Tell us in the comments!